I like vintage and I like new, they both have their place. 4_everyman, SirMarc and Nomadicarchivist like this. True enough... I forget to mention that I occasionally plug my laptop into the AUX port for YouTube!! I used to do that. I have a Peachtree iNova that is equipped with a USB input. But as of a few years back, I moved to the Chromecast device, which I keep plugged into the system processor. I use a 7" Amazon tablet to cast YouTube music video's and relaxing ambient background sounds and video, like the this "rain" video. Having the video along with the audio gives a better mood setting, with the inclusion to the 65" curved TV screen. Onkyo + Elacs - Incredible value for the money - the connections are solid on this thing, it does scream quality, a very heavy unit overall. I would describe this amp + speaker combo as warm, fairly neutral. Presenting the music as it is. If your source is crap - you will get crap. Crap in = Crap out. The imaging with the Elacs is incredible. I watched The Beatles Eight Days a Week - I thought John was in the room with me, I wasn't expecting that level of detail and soundstage from the live performances. 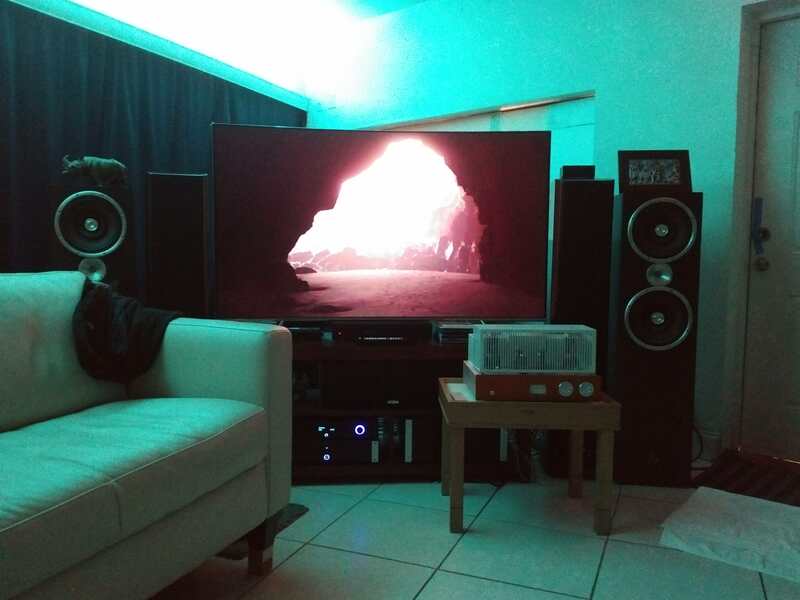 I also watch David Gilmour - Live in Pompeii (2016) - also very, very impressive. The Emotiva + Elacs - this is where it got interesting - to my surprise the Emotiva was a bit grainy, a little harsh on the top end. Didn't have the smoothness of the Onkyo. I was definitely shocked. I thought it might've been my connections or some kind of user error - No, everything was connected and isolated accordingly. I again, ran the Gilmour in Pompeii HD video - same results - the bottom was taught - but the top end was a bit harsher. Definitely not as warm on top. Maybe there's a slight roll-off in the Onkyo? Not sure. I will trial both Vinyl connections tonight! This is all subjective - this is from listening tests with under 2 days of burn in. So, YMMV and all that jazz. Thanks guys - will report with more. bhazen, CraigVC, SirMarc and 2 others like this. Good for you, it all comes back to listening, nothing can touch the actual listening experience. Just a note, this is Emotiva's very entry level product, which I believe is around $300. The Onkyo A-9150 Integrated currently sells for about $150 more and retails for $200 more. I feel like the A-9150 has a lot of trickle down from their Reference line. One day - I hope to get a super resolving system - but I don't think 1K will do that. I can get pretty close with Hi-res FLACs - but I think better speakers will be next. I will say this - the lack of connectivity (on Onkyo) is a sore point - but I wanted a future proof unit - and this is definitely one. I wish it had a USB connection - bluetooth is easy enough to add now. I would say it's perfect (amount of power) for someone who is sharing walls like myself. I haven't had it up all of the way yet, but I tested to see if it distored, the Onkyo didn't - but the Emotiva did slightly - almost a slight distorted sound. Any reason why that could be? Go with what your ears tell you. I think you did well; I've owned Onkyo gear, thought it was really solid. The Andrew Jones-designed Elac speakers are simply astounding. 6.2's for less than $300 ...?! Crazy. SirMarc and StateOfTheArt like this. You might want to place a call to Emotiva's technical support staff. I do realize this is an entry level piece of gear, but Emotiva gear always has plenty power and power reserves. This is why it can drive a 4-Ohm load. I can understand one amp sounding better or having slightly different characteristic's than the other. But you should not have any audible distortion at the levels that you are playing at with either amp. I have played 25-Watt SS amps, with less than efficient speakers without ever having distortion. Once you get to 50-Watts, there is no way that you should have distortion at moderately high volume levels. Any opinions here on the Chinese tube amps? Yaqin MC10? If your in the UK Marantz PM5005 on Amazon new for £165 at the moment. Check out what HiFi reviews for the Marantz and Onkyo. The Marantz don't have a sub out LFE if your wanting To add a subwoofer later. (Although you can get subs that feed off the speaker wires) But great amp at that price. Think it was around £500 for that model a few years ago. Best to stick with the major player's with established reputation's, like PrimaLuna and LineMagnetic. Those will hold a respectable resale value. Most of the others, not much so. These have known established build qualities and use P2P hand wiring. They also have established distributors and dealers in the US, for support and warranty issues. I do own both of these brands and am completely satisfied all the way around. You have to spend much more than that on a tube amp to get to the level of the Onkyo you've tried. Think Line Magnetic, PrimaLuna. Tubes on the cheap lead to disappointment. Reason is they need very expensive parts (mainly the transformers) to sound good. PS I do like Yaqin's affordable phono pre. Good point! Consider that this gear is already made in China to cut down on the costs of labor and materials. That being the case, factory A and factory B are on equal footings. Factory A spends more to produce their product than factory B, Factory B sells their product for less than factory A. Which factory do you want to buy from? I see things that are very very nice for about 600 and up. But below 5- forget it. The MartinLogan LX16 is on clearance on Crutchfield - $480 for the pair (down from $800). They also have some open box and scratch/dent options for even less. I used to own a pair. They sound and look great. The metal magnetic grille is a nice touch, and the piano black finish is gorgeous. An added benefit is that they have a sensitivity rating of 92dB, so that 50 watt Emotiva integrated would be able to get them plenty loud in a small or medium sized room. Another amp to consider is the NAD C 316BEE V2 - same price as the Emotiva TA-100. It doesn’t have a built-in DAC but does have tone and balance controls. The NAD currently drives my Ascend Acoustics Sierra-2 86dB sensitivity speakers to satisfying levels in my 12x12 room, for what it’s worth. Yes - Mikey said to go with the Onkyo - he said he heard it and was actually really great. Or a Sprout100 - which are impossible to find below retail. If I was going to go 600 - I would buy an Outlaw Audio Intg. I gave up being a professional musician thinking - this'll be better.. less intense. I was sooooo wrong. If a guy with probably a million dollar system, and the ears to appreciate said system, says the Onkyo sounds great, I'd probably go with that. You may be over thinking this lol. Are you enjoying how it sounds? Me too, for the amp. That or other Yamaha, preferably used, in the same series (301, 701, 801).